Kick off your visit on the 1st (Wed): tour the pleasant surroundings at Santa Catarina Park, get great views at Pico do Facho viewpoint, and then identify plant and animal life at Ponta de Sao Lourenco. On the 2nd (Thu), you'll have a packed day of sightseeing: get up close to creatures of the deep with a dolphin and whale watching tour, learn about winemaking at Blandy's Wine Lodge, and then pause for some serene contemplation at Igreja de Nossa Senhora do Monte. For photos, traveler tips, and other tourist information, use the Funchal driving holiday planning tool . Sao Paulo, Brazil to Funchal is an approximately 16.5-hour flight. You can also do a combination of bus and flight. The time zone difference moving from Brasilia Time (BRT) to Western European Time (WET) is 3 hours. In May, daytime highs in Funchal are 25°C, while nighttime lows are 19°C. Wrap up your sightseeing on the 2nd (Thu) to allow time to travel to Ponta Delgada. 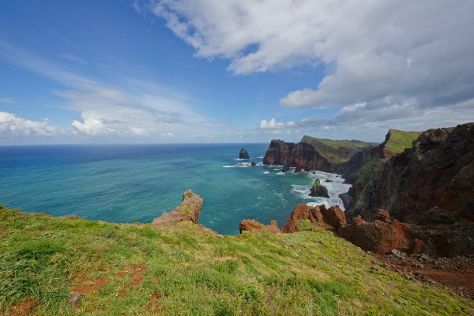 On the 3rd (Fri), take in the dramatic natural features at Poca Da Dona Beija, then take in the dramatic natural features at Caldeira das Sete Cidades, and then get great views at Boca do Inferno Viewpoint. Here are some ideas for day two: explore the activities along Lagoa do Fogo, then get great views at Serra da Barrosa Viewpoint, and then take in nature's colorful creations at Parque Terra Nostra. Plan my day in Ponta Delgada using traveler tips and tourist information provided by Inspirock. You can fly from Funchal to Ponta Delgada in 5 hours. Due to the time zone difference, you'll gain 1 hour traveling from Funchal to Ponta Delgada. When traveling from Funchal in May, plan for a bit cooler days in Ponta Delgada, with highs around 22°C, while nights are about the same with lows around 17°C. Finish your sightseeing early on the 4th (Sat) to allow enough time to travel to Porto. On the 5th (Sun), get the lay of the land with Walking tours, make a trip to Livraria Lello, then contemplate in the serene atmosphere at Porto Cathedral (Se Catedral), and finally take in the views from Ponte de Dom Luis I. Take the guesswork out of planning a Porto vacation by using our trip itinerary maker. Traveling by flight from Ponta Delgada to Porto takes 5.5 hours. You'll lose 1 hour traveling from Ponta Delgada to Porto due to the time zone difference. Plan for a bit cooler nights when traveling from Ponta Delgada in May since evenings lows in Porto dip to 13°C. Finish up your sightseeing early on the 5th (Sun) so you can travel to Lisbon. Take a break from Lisbon with a short trip to Quinta da Regaleira in Sintra, about 36 minutes away. There's much more to do: wander the streets of Belém Tower, meet the residents at Lisbon Oceanarium, take in the spiritual surroundings of Jeronimos Monastery, and step into the grandiose world of Castelo de S. Jorge. To find ratings, more things to do, and more tourist information, use the Lisbon trip planning app . Traveling by flight from Porto to Lisbon takes 2.5 hours. Alternatively, you can take a train; or drive. Expect somewhat warmer weather when traveling from Porto in May: highs in Lisbon hover around 28°C, while lows dip to 15°C. Finish up your sightseeing early on the 8th (Wed) so you can go by car to Evora. 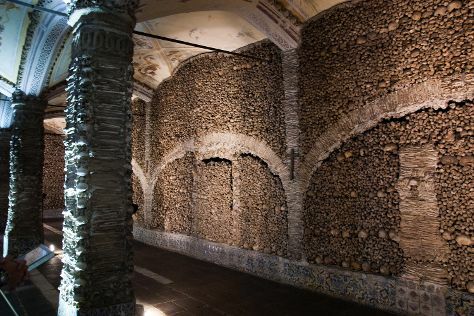 Kick off your visit on the 9th (Thu): contemplate in the serene atmosphere at Templo Romano de Evora (Templo de Diana), don't miss a visit to Centro Historico de Evora, take in the spiritual surroundings of Cathedral of Evora (Se Catedral de Evora), then don't miss a visit to Lookout - Cordovil House Gallery (Evora), then take in the spiritual surroundings of Capela dos Ossos, and finally look for gifts at Tou c'os Azeites. For reviews, where to stay, ratings, and tourist information, use the Evora vacation app . You can drive from Lisbon to Evora in 1.5 hours. Alternatively, you can take a train; or take a bus. In May, daytime highs in Evora are 30°C, while nighttime lows are 13°C. Wrap up your sightseeing by early afternoon on the 10th (Fri) to allow time for travel back home.